In an effort to strengthen my atrophying drawing skills, I am attempting to draw at least one sketch a day in order to improve. Sometimes these will be digital sketches or scribbles on a napkin. Hopefully you enjoy what you see, if not, feel free to laugh and point. 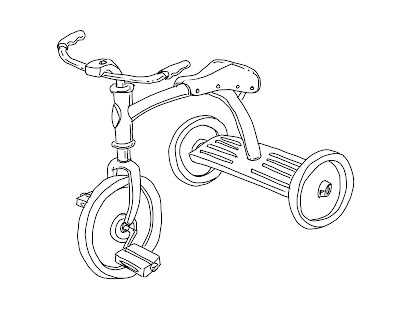 This is an idea I had for a shirt, a quick, digital sketch of a tricycle. Sweet. Slap some red on there and you're good to go. What'd you draw it with? Thanks Jake! I drew it using Sketchbook Pro 2009 on my tablet pc.